Just look at that slope. 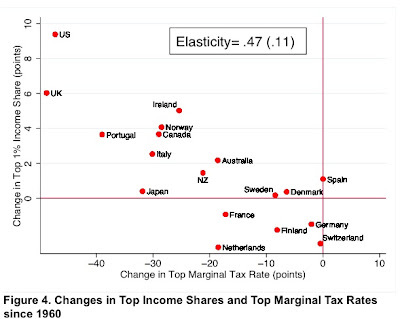 Tax policy, which has varied over time and differs across countries. 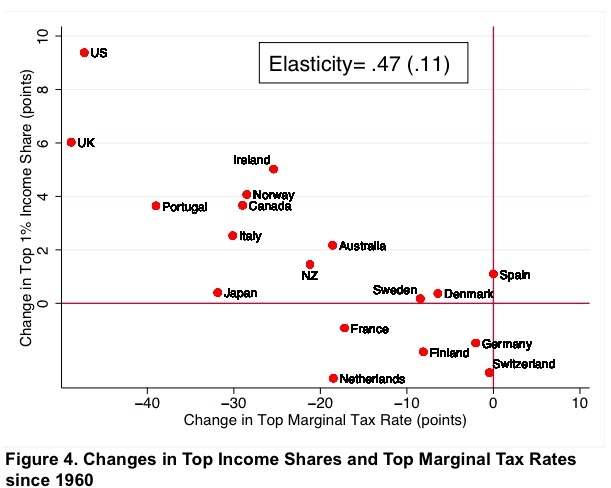 Top tax rates have moved in the opposite direction from top income shares. "A richer view of the labor market", where we contrast the standard supply-side model with one where pay is determined by bargaining and the reactions to top rate cuts may lead simply to a redistribution of surplus. Top rate cuts may lead managerial energies to be diverted to increasing their remuneration at the expense of enterprise growth and employment. Capital income. Inherited wealth is, in Europe if not in the United States, making a return. The correlation between earned income and capital income, which has substantially increased in recent decades in the United States. This has hardly been investigated.